boasts of both in equal measure. Hyundai EON boasts of a large boot space to make sure you carry everything that you need on your family weekend jaunt with a 215 trunk capacity. The ergonomically desinged front seats are well contoured to provide sufficient thigh & back support for enhanced seating comfort. The curvy centre console with metallic highlights imparts style and houses various ergonimically placed controls. The sporty look of the console and instrument panel is finally topped off with a 3-spoke steering wheel accentuated with metallic inserts. The tilt-adjustable steering column lets you have the precise control you want. Eon doesn’t compromise when it comes to heating, cooling and ventilation. The core of the system is a front heater core, a 4-speed blower driven by a powerful motor and easy-to-use rotary-type controls. An effective air conditioner ensures that the inside is always cool and comfortable, no matter what the temperature outside. 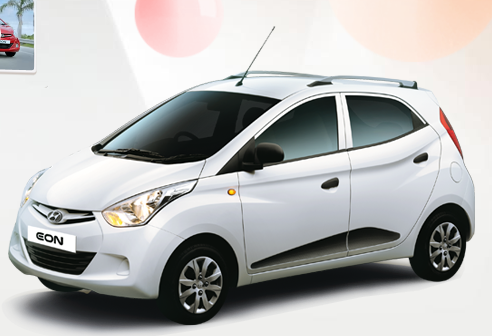 Another marvel from Hyundai the kappa engine is equipped with latest technologies like Dual VTVT, DOHC and lightweight cylinder block. With class leading power of 69 ps and 9.6 kgm torque, this engine promises to deliver enhanced driving pleasure with superior mileage of 20.3 kmpl. MDPS provides sharp response and accurate handling while driving. Its compact & lightweight uses less components making the MDPS less noisy and helping boost fuel economy. While the tilt function enables you to adjust the steering angle to suit your driving style.